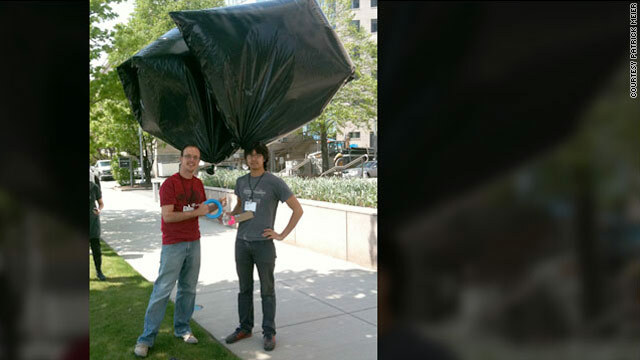 Jeffrey Warren, right, and Patrick Meier test their idea for making trash bag weather balloons that shoot aerial photos. Walk up and down the Louisiana coast holding a kite string that's tethered to a helium-filled trash bag and a point-and-shoot camera. The set-up may sound goofy. But Warren's aim is serious. The 26-year-old is trying to monitor the effects of the oil spill that threatens to wreak environmental and economic havoc on the Gulf Coast of the United States. Warren knows that satellites and other official means are used to measure the extent of the oil spill, which occurred after an offshore oil rig exploded on April 20 and subsequently sank, causing an underwater oil pipeline to rupture. But satellites only come by so often. And they are much higher in the air. Hovering at 1,000 feet above the ground, Warren's camera is able to take pictures with 100 to 1,000 times better resolution than the satellites, he said. "There's a lot of need for documentation on the scale of a person," he said Wednesday from Louisiana, where he had just arrived to set up monitoring efforts with the help of local people and organizations. "My hope is that some of this data will play a role in the litigation and the legal situation going forward," he said. Warren, who has been working on these "grassroots mapping" efforts for several months, is among a number of people and organizations trying to empower ordinary citizens to document the effects of the massive oil slick, which, according to the U.S. Coast Guard, has released more than 1.6 million gallons of crude into the waters of the Gulf of Mexico. As that pollution heads toward the coast, it becomes all the more important that local people help monitor its effects on people, the environment and wildlife, local workers said. They also aim to involve local people in the disaster response, both to keep them from feeling helpless in the wake of the incident and to collect useful data about the extent of the damage. The volunteers are using a number of new and newly improvised technologies to accomplish these goals, which generally fall within the trend of "crowdsourcing," or using the skills of many people, in response to a disaster or conflict. An environmental group called the Louisiana Bucket Brigade launched an online map Monday to show the breadth of the oil spill's impact. The map is made up of reports from individuals who live and work along the coast, and it's powered by open-source code from a group called Ushahidi, a platform that was developed in response to the Kenya election violence of 2007. Ushahidi's code has been used to spread citizen reports to emergency responders in the aftermath of a number of disaster scenarios, from the earthquake in Haiti to the "Snowmageddon" storm in Washington this year. Most of the 80-some reports that have been fielded by the Louisiana group come from fishers who say their livelihood is threatened by the oil slick, which has infested their fishing waters, said Anne Rolfes, director of the Louisiana Bucket Brigade. "The idea is to translate local knowledge to the greater community," she said. "It's the liberalization of information and of knowledge. We have thousands of reporters now instead of just a few." Anyone with a phone can upload stories, photos and information to the site. People can send text messages reports to 504-2727-OIL or e-mail them to BPspillmap [at] gmail.com. The group shares this data with Google, which has assembled a multilayer map of information about the Gulf oil slick. CNN iReport, a site where the site's users submit news, also is collecting reports from the Gulf. The Louisiana Bucket Brigade wants the data to be used both by emergency responders and by neighbors, who may figure out ways to help each other. Patrick Meier, director of crisis mapping at Ushahidi, said the environmental disaster in the Gulf is different from situations where lives are immediately at stake and lines of communication are often cut. But he thinks the Ushahidi mapping model will be useful in new ways now. "You can actually have people on the ground help each other out in near real-time, before the emergency responders even get there," he said. Jen Ziemke, who with Meier co-founded the Crisis Mappers Net, said that reports from individual people in the wake of disasters help emergency responders understand where the greatest needs are. They also connect people to each other. "It's about empowering them to say, 'Tell us your story. Tell us how we can help,' " she said, "and having them be a part of that help as well." Since communication lines remain open in Louisiana, and because so many Americans carry smartphones with GPS locators and cameras, applications are being developed to help crowdsource the oil spill response. A group called Crisis Commons, for example, plans to launch a smartphone app in two days that will let people upload photos of the environmental impacts they see, said Heather Blanchard, co-founder of the organization. The app, called Crisis Commons Oil Reporter, is being developed by volunteers for the iPhone, Android phones and the BlackBerry, she said. The group plans to make it available for free. The information will be posted to the Crisis Commons site and will be analyzed by scientists at San Diego State University and the University of Colorado at Boulder, she said. It will also be made publicly available, so it could be included on the Louisiana Bucket Brigade map, too, for instance. "We're wanting to establish an open data feed about what people are seeing," she said. CNN's iPhone app also lets people upload their stories to iReport. Warren, the MIT student monitoring the coast from the air, said the data he and others collect will be posted to the website Grassroots Mapping. He wants it to be publicly available, so it can be used in investigations. He sees his work as a supplement to efforts by Google and others to monitor the Earth from satellites. Those efforts are important, but they often don't stick around too long after the news attention on the crisis wanes, he said. He traveled to Louisiana with another MIT student, and together they have three weather balloons, a bunch of kite string, 10 cameras and a number of trash bags that can be filled with helium to float. Each balloon-camera rig costs less than $100, he said. The cameras are scripted to take photos every five or 10 seconds, he said. They can be stitched together to create composites. Working with local activist groups and residents, he hopes to empower people to monitor the coast with balloon cameras for months -- or as long as it takes for the impacts of the oil spill to dissipate, he said. "If we do it now, it's a relatively low cost, and it's a time commitment, but if we get out and begin mapping, we'll have that data at a later date -- when we wish we had it, perhaps," he said. He got this idea by working with a fellow MIT student, Oliver Yeh, who has been flying untethered balloons nearly to the edge of space, sending back photos over a cell phone -- partly just for the fun of it. "It's the first time we're working together as kind of a concerted effort. We're applying these tools not just as hobbyists or enthusiasts but applying them to a specific social and environmental goal," he said. "This is one area where we're able to make an impact."